Full refund if cancelled within 10 days of registration (if before 15 Sep 2018). Additional deposits and final payment information will be invoiced to you via email. See trip details for pricing. Membership of Boca Ski Club is a requirement. If you are a member of another FSC club in Florida please register using this option. 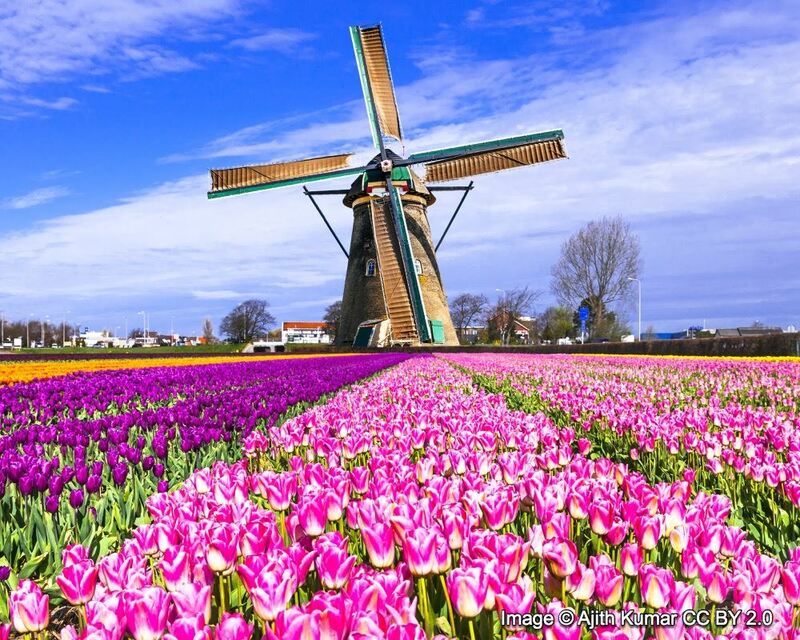 This awesome trip includes 7 nights on a Comfort Plus class barge, with daily, guided bike tours of about 22 to 28 miles per day through the Dutch countryside and past beautiful tulip fields, plus two additional nights in Amsterdam! Airfare, most meals, & bikes are included. Private bus transfer to the sea port, arrival no later than 2:00 p.m. When you arrive on board you can put your luggage away in your cabin and then enjoy a cup of coffee or tea. It is also a good moment to become acquainted with the guide, skipper and crew and of course your fellow passengers. The first part of the tour you will sail to Spaarndam – known as the village of Hansje Brinker – and from here we make an easy ride into the beautiful city of Haarlem. Todays trip leads you through the oldest tulip fields of Holland and along the Keukenhof. Of course you’ll have time to admire the most beautiful bulb park in the world (tickets are included in the tourprice). Keukenhof is the place where the spring breaks. An overwhelming blaze of colours; seven million flowering tulips in a magnificent 80-acres’ background of traditional and modern gardening architecture. You also can admire the various hyacinths, narcisses and many other colourful flowers. You spend the night in Leiden which is Rembrandt’s hometown but also Armin van Buuren. Today you continue your tour around the Haarlemmermeer, with a lunch stop at the other side of the bridge in Leimuiden. Imagine that this polder once was the biggest lake in Holland and nicknamed ’the waterwolf’. The cycle route leads you through the green heart of Holland, an area characterized by small cycle paths, typical black and white cows and despite the work of Mr. Leeghwater, a lot of water. Your destination for today is Kudelstaart: a small town bordered by the Westeinderplassen. Every morning "Bloemenveiling Aalsmeer‟ sets the world price for flowers and plants. As a visitor you can walk over a specially designed gallery to experience the hustle and bustle of demand and supply experience the hustle and bustle lead by the auction clock but also enjoy the gorgeous flowers that are showed in. While flowers and plants start their world tour you will have breakfast while sailing towards Amsterdam. Between the airport Schiphol and the city you disembark to continue your tour by bike along the river Amstel and right into the city. A ferry (don’t forget to take a look to the left where you see whale tail shaped building of the eye filmmuseum) brings you to the other side of the river ’IJ’. Here you leave the city behind and continue your tour through lush green polders towards the world famous hamlet of Zaanse Schans. A unique place where people live and work, with original houses and windmills from the river Zaan area. From Wormerveer you will cycle through the most beautiful dunes of the Netherlands and if weather permits, you may like to swim in the North Sea during your lunch break at the beach. Todays’ overnight stay is in cheese town Alkmaar. An historic lively city with many small and bigger shops. A little less than 400 heritage sites, canals and harbour dominate the townscape. Today time to cycle into the polder landscape of the Beemster and Purmer, part of a big green polder area.The Beemster Polder, dating from the early 17th century, is an exceptional example of reclaimed land in the Netherlands. It has preserved intact its well-ordered landscape of fields, roads, canals, dykes and settlements, laid out in accordance with classical and Renaissance planning principles. Also time to visit one of the big water mills at the Rijp. Purmerend lies at the edge of an area called ‘ Waterland’ where roads and water are nearby on the same level. We visit the nice village of Zunderdorp and Ransdorp. The better cyclists can cycle the long route to Edam and Volendam and if time permits you can cross the lake Gouwzee to admire the traditional fisherman’s village Marken with its typical wooden houses. In Amsterdam you can look back at cycling seven days in great variation of typical Dutch landscapes, towns and many highlights. Disembarkation after breakfast. Private bus transfer to Schiphol Airport for return flight to Miami. Air transportation between Miami and Amsterdam, via Delta Airlines. Transfer between Amsterdam Airport and Hotel via private coach. Transfer between Amsterdam hotel and Sea port via private coach. Transfer between Ship and Amsterdam Airport via private coach. Return flight to MIA via Delta Airlines. The Sailing Home is a Comfort Plus class ship. Built in 2001, this barge was designed with an emphasis on comfort. $ 1,500. for Baggage and Travel Documents. $ 400. for Baggage Delay. $ 50,000. for Medical Expense. $250,000. for Emergency Medical Transportation.